Essie Gardner is an experienced Communications Specialist and has also served in the academic arena. Currently she is Marketing Communications Manager for the Jamaica Tourist Board and the Director of GTTP Jamaica, a travel & tourism programme aimed at exposing secondary level students to the industry. The Jamaica Tourist Board is the government agency charged with marketing Jamaica as a tourist destination. As the JTB’s Marketing Communications Manager. Ms. Gardner has operational responsibility for public relations and brand management initiatives. Prior to her appointment as Marketing Communications Manager, Ms. Gardner served as tourism education specialist for the island. 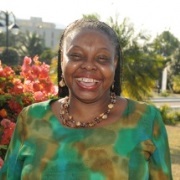 During this period she pioneered the Tourism Infusion Programme for Jamaica and was instrumental in training other CTO member country representatives to implement the programme in their home territories. She also broke new ground with the formation of Tourism Action Clubs in schools across the island and with the introduction of GTTP Jamaica. In addition to her work at the Jamaica Tourist Board, Ms. Gardner lectures in Public Relations, Public Speaking and Business Communication Studies at the undergraduate level and conducts seminars/workshops for professional groups. Professionally, she is affiliated to the International Association of Business Communicators and is currently the Lieutenant Governor, Marketing for the Caribbean District of Toastmasters International, responsible for membership and club growth. Ms. Gardner attended the University of the West Indies, and has completed specialist post graduate certificates in Japan and Holland.